Mt. San Jacinto Outdoor Recreation • View topic - best neighbourhood for trail access? best neighbourhood for trail access? i will be renting a house in the Palm Springs/Palm Desert area next year. i am a trail runner from BC. I like to run 15-20 km routes, easy to moderate difficulty. i am interested in some locals views on what neighbourhood I should rent in that would give me convenient access to a good range of trails. I don't mind driving to the trail head, but it would be nice to minimize my driving time. Re: best neighbourhood for trail access? South part of Palm Springs would give you quite a few options within walking/running distance. The Museum/Skyline trail, Lykken trail from Ramon Road, Mesquite Ave and off of South Palm Canyon Drive, Garstin trail, Shannon trail, Araby trail. Also trails in the Indian Canyons. Lots of options. I hike these trails all the time. Let me know if you have any questions. I agree with Florian, the South Palm Canyon area is your best bet. There are many condos there for rent, too, and also a couple of MH parks which would not be bad for renting. From there most of the THs will be ten minute away. It also might be good to be down on Hwy 74 (again many condos nearby) in Palm Desert as from there you have fast access to many Santa Rosas THs. But I would say South Palm Canyon would be my choice. For trail running you would probably want to be near to the Art Smith TH, either at the Hwy 74 end, or the Palm Springs end off the Garstin TH. 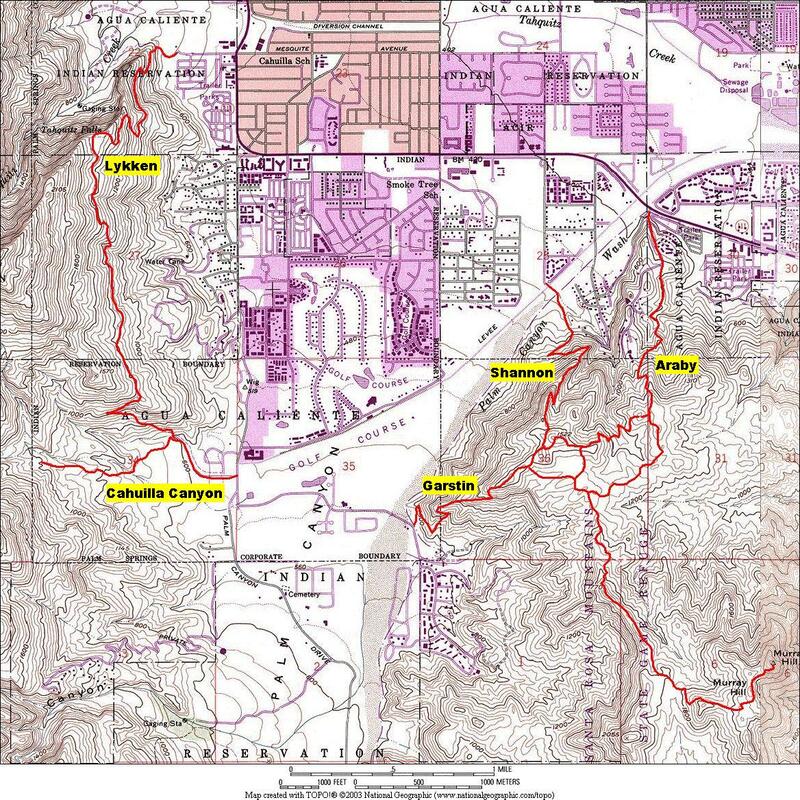 littlejoe, i put together a bit better map of local Palm Springs trails based on some recent GPS tracks ..